Description 27th Annual Columbia Gorge Aluminum Man Triathlon, sponsored by Northern Wasco County Parks and Recreation & Mid-Columbia Medical Center. 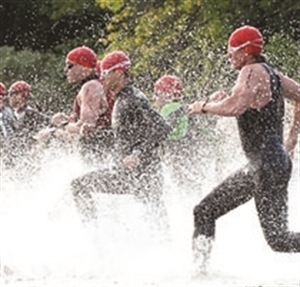 Triathlon: Swim is in the Columbia River, water temperature is 65-70 F; wetsuits permitted. Bike course has gentle hills. Run course is level along the Columbia River. There are 12 age divisions for each race (starting with 15 & under in 5 year increments - ie: 16 to 19 years) as well as Clydesdales and Athenas. No team entries in this race. Duathlon: The Duathlon is a bike/run format and follows the same course as the Olympic Triathlon (50K Bike, 10K Run). Duathletes will start in pairs in time trial fashion AFTER the first Olympic Triathlete mounts their bike. Teams: Olympic Duathlon and Olympic Triathlon Teams. Olympic Triathlon teams may be comprised of two or three team members. Team swimmers will begin with the Olympic individual wave. Riverfront Park, The Dalles, Oregon. Take Exit 85 from I-84, turn north to the Park (follow signs). Add 27th Annual Columbia Gorge Aluminum Man Triathlon to your free online travel itinerary.